Well, these payment advices are from the Australian Government (Department of Communications and the Arts to be exact). I''ve never understood how it works. My publisher applied it for me; and I just sit here waiting for the money to arrive once every year. I heard the basic idea is, because my books are in many public library and one copy has been shared by many readers. So it is unfair to the author who only receives royalty for one copy. So the government pays the authors "public lending right" to compensate us. Quite good policy, right? 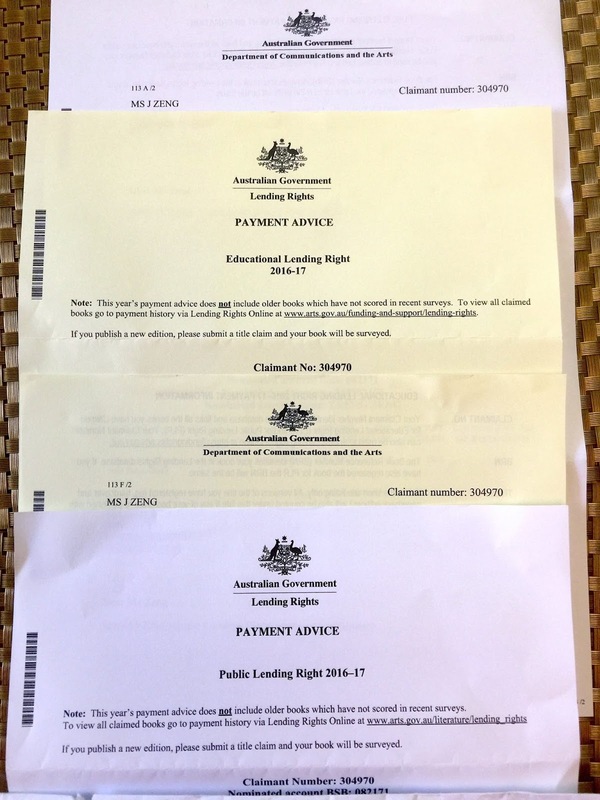 I have also been paid "Educational Lending Right". I didn''t bother to understand what this is, but googled it in order to write this post. 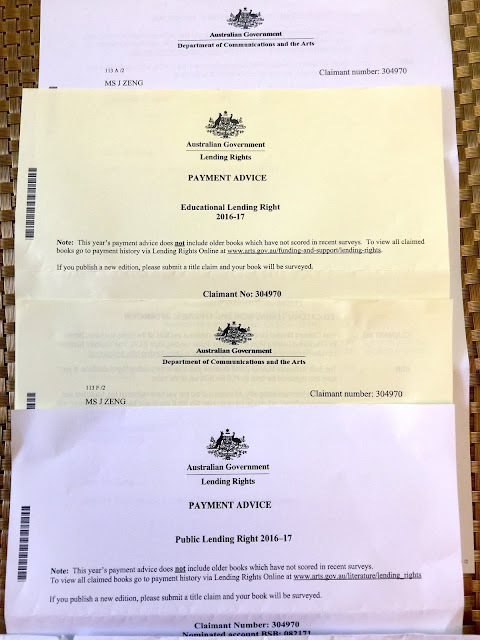 "Australian book publishers or creators—authors, compilers, editors, illustrators and translators—can be compensated for the loss of income through the free multiple use of their work in Australian public and educational lending libraries." Yah, so it must be that many school libraries also have my book in collection. I think they did the right thing. A journalist wrote in a Sydney Morning Herald review that my book "Witnessing History-One Chinese Woman’s Fight for Freedom"(https://www.allenandunwin.com/browse/books/general-books/biography-autobiography/Witnessing-History-Jennifer-Zeng-translated-by-Sue-Wiles-9781741144000) "Should be mandatory reading". Valerie Pybus, a Past President of both the Society of Women Writers NSW Inc, also said that "This Book Should be Compulsory Reading for the Younger Generation".